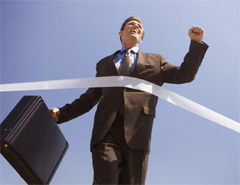 How to become successful business man? Home » Business Ideas » How to become successful business man? Many people today aspire to be successful business owner but they fail. This may be due to lack of knowledge or training. When you start your own business, you also should learn how to make business successful. If you are starting fresh and seeking help to become successful business owner we are herewith behavioral aspect of successful businessman. Time is money. To run business effectively you should start managing your time well. Extra time can be utilized for thinking about new product line or business enhancement. Another challenge which businessman comes across is having productive employee in team. Selection of right person for right work will defiantly make difference. Attitude is most critical aspect for running successful business. You should develop positive attitude in order to be successful. Your attitude must have following elements. Companies that don’t have good business plan or strategy are like ship in harbor without water they just go on a circle. They have trouble in understanding how to go ahead, for them they not define what success means to them. If you don’t have strategy you don’t know how to hire people, how to fire people, who are your customer, what are potential market etc. Strategy doesn’t have to be long document it can be simply one page guiding document. Business strategy document is living document and one must revisit and review this document at regular frequency. You must be discipline in order to be successful business person. Many companies create business strategy and document but they don’t follow it. If you don’t work on plan you create you will not be successful.